Welcome to a new series called SUNDAY STYLE that I’m starting on random Sundays. I’ll be offering design lists and tips and feature items that have attracted my eye. I’m at our beach home for a few days, so it’s befitting that this week it’s all about coastal living room design. I’m often asked where I purchased this or that and I’m happy to share when I can. Many of the pieces that have ended up at the beach home were flea market or yard sale finds. Mixed in with new it becomes a signature style and creates a look that is subtle. I work with a budget like most everyone and spend more on what I feel needs to last. Obsessed with design and scouring the internet, I shop for possible redesign and for friends and work life. Others window shop online for clothing, shoes and handbags and then there are those of us who shop for decor items! 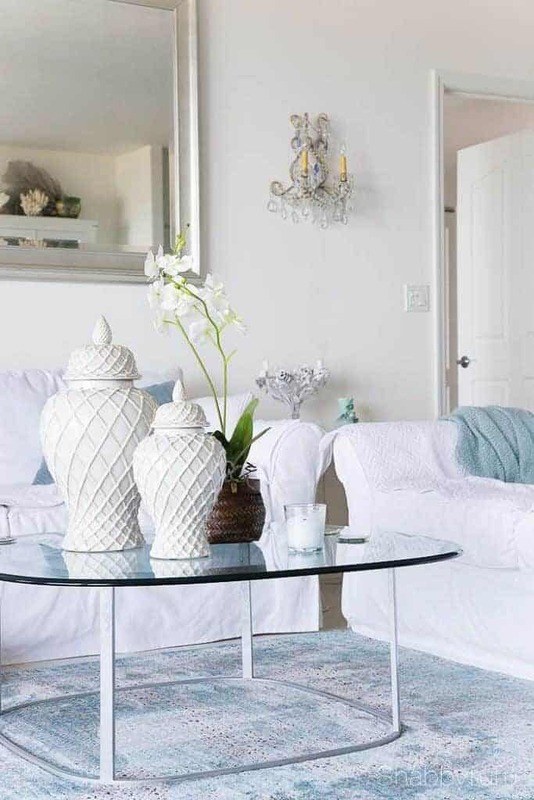 If I could I would infuse coastal living room design in a subtle way to everyone of my friend’s homes who feel that coastal = fish plaques on the wall and more obvious looks. This coastal home is beautifully done and clutter free, allowing the architecture to be the star. The water view is perfect in this home below and the sophisticated neutrals mixed with blues are understated. The coastal living room design doesn’t need much else and the beach vibe is simply implied. Every living room starts with a sofa. 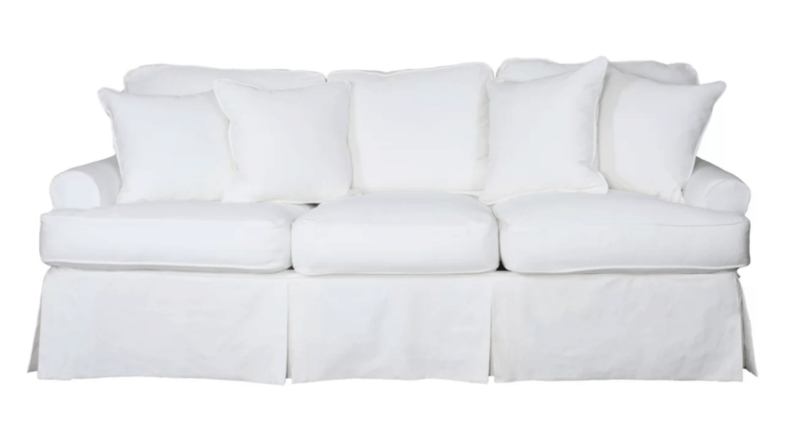 My preferred sofa style is white or neutral so that you can play with pillows and throws as the seasons change. Our beach home has had the Pottery Barn white slipcovered sofa (find that HERE) and loveseat shown in the top image) for about 3 years now. They are pricey and worth it, but I found the alternative below at a fraction of the cost. Click HERE to shop the sofa. 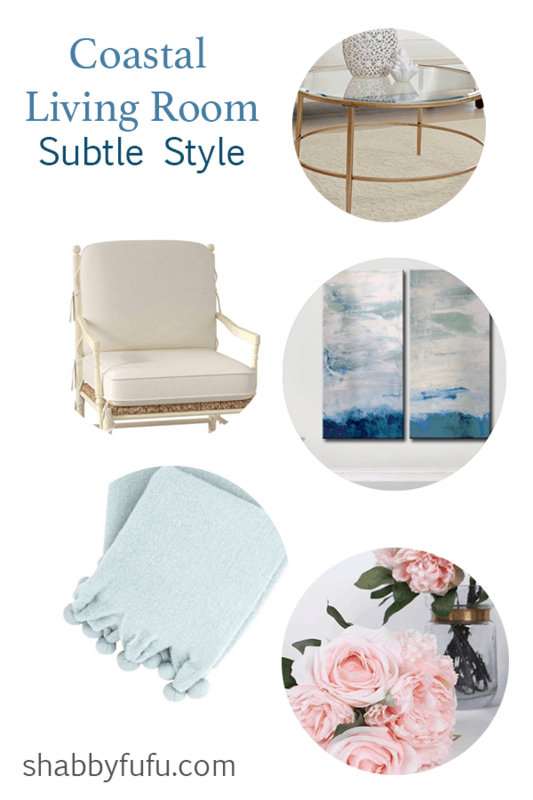 Beyond the sofa I’m featuring some favorite finds in a retailer spotlight that are all quite affordable and I think you’ll be pleasantly surprised! 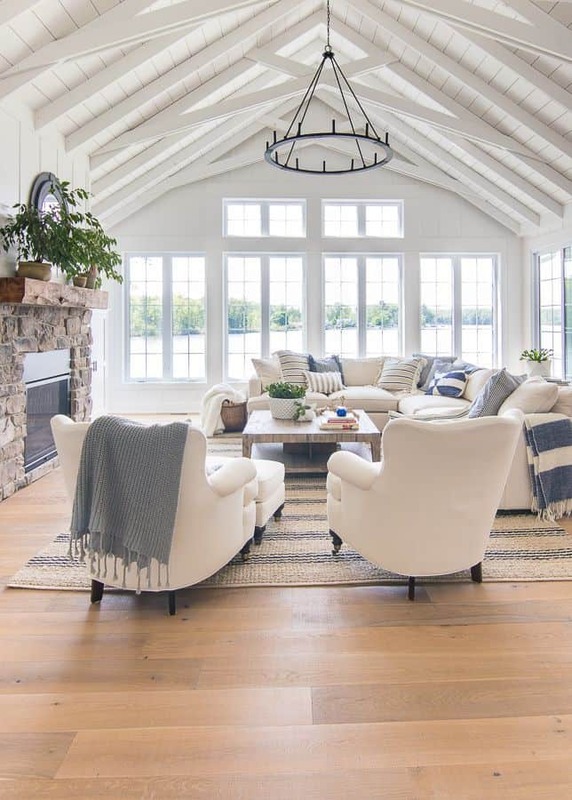 Whether you live on the coast or deep in the middle of the country, adding some coastal living room design can give your home an elegant look and feel! Great tips and ideas! It can be difficult to strike the correct balance between relaxed beach style and tacky tourist shop! I tend to be more kitschy with my outdoor and family room, within reason, and breezy coastal in the living room. Nods to the shore are in all places but there’s a difference between a photo of a beautiful ocean sunrise and a sign that says it’s margarita time! LOL! While I admit that I like both, I don’t want our home to look like a souvenir stand! I like to use subtle colors like in your posts and natural elements. You always have the best ideas! Thank you for sharing! Thanks Leena! I think you hit the nail on the head that you don’t want your home to look like a souvenir stand. If it’s not stuffed full of too much, I think that’s the trick of a successful kitschy playful style. Enjoy your week! Hi Janet! I know what you mean about all that kichy coastal decor so many people think defines coastal decor. The horrid fish on the walk and little beach signs, buoys, lighthouses and anchors everywhere! Ughhh. It’s all about the colors you use to evoke thoughts of sand, sea and sky. I love this book of a designer I can’t think of his name off the top of my head, but his signature is blues and white, creams too where appropriate. He does coastal so beautifully and his rooms are so soothing that you feel like you’re at the beach. He uses lots of pale aquas, driftwood beams, tasteful wicker, oh I could just go on and on. I THINK his book may be called Beautiful, I could be wrong though. Your beach house has a lot of the colors he uses and I really love your beach house. 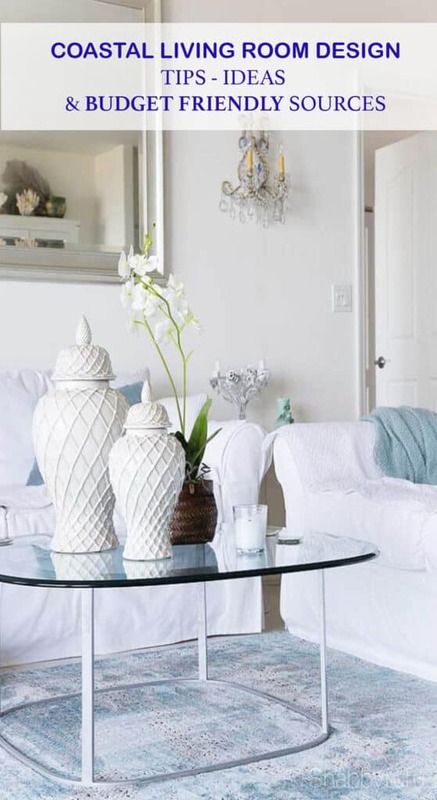 I love your other home too, and have taken lots of ideas from you, but my taste can’t be quite as feminine as yours because my former football playing partner would be so uncomfortable and wouldn’t stand for me decorating quite that feminine, lol! I’m a French country girl all the way, but I have to make it a bit more rugged male friendly. Lucky you that has a husband who lets you decorate like you want and is OK with all the femininity! I’m so jealous! I love your blog and always learn something from you,so thank you! Hi Sheila! I know exactly who you are talking about and that’s Mark Sikes, a favorite designer indeed! He knows how to infuse coastal decor in a subtle and non obvious way and I’ll have to get out his book again and refresh myself. Honestly I don’t consider my homes overly feminine, just a few touches of pale and pastel. Did you see my post about my husband’s home office upcoming reno? Have a wonderful week! Love your slipcover/ sofa find. A great option to the PB version. Was thrilled to see the robins egg blue throw, but the price point for me seemed way too high. Too often I find throws pill or look worn too quickly to justify paying that much. I think your decorating style is perfect! Might actually get to that point sometime. I have very eclectic taste – a few traditional pieces, slightly rustic, French Country (easy on the flowers) a touch of industrial and a smidge of shabby chic – but have a bit of a problem bringing it together. I would like to know where the 2 white jars on your table came from. Couldn’t find them in your curated section. Also, I downloaded your beautiful picture of the flowers with the bike and unless I size it to 50% I’m unable to print it without losing 3/4 of the right side of the picture. Any suggestions. Thank you for your blog, it’s wonderful. As for the printable, I don’t have that issue so I think that it must be something on your end.